• Opt for a place that is clean, open, and full of natural light for your “getting ready” space. This intimate time is so special and sets the tone for the rest of the day. A room that is free of distractions and well-lit makes for amazing pictures of a bride with her closest ladies. In addition, a relaxing space helps encourage being more present to enjoy the simple moments before the ceremony. • Have small details like the wedding rings, garter, shoes, jewelry, etc., stored in an easily identifiable container (I love a good excuse to invest in a beautiful box). Having them all in one place helps ensure they are captured as part of the story. Ask your florist for a few spare flowers and pieces of ribbon to style your details to match your décor. • Use caution if deciding to do a synthetic tan or catch some beach sun prior to the big day. Artificial tanning (spray, tanning beds, etc.) can cause skin tones to turn a saturated pigment that is hard for the camera to recognize. It’s similar for skin that has been overexposed to the sun, which shows up bright pink or blotchy on camera. Both situations are very difficult to fix in the post-process phase. Avoid sun exposure and chemical tanning about 72 hours before the event, and stay hydrated for a healthy, natural glow. • Have an honest conversation with the photographer about mutual expectations and what images are most important to capture. Timelines, while a great “guide” for the day, often get tight if situations arise. Knowing what photos are top priority helps if time is lost due to things like wardrobe malfunctions or unexpected weather. Ask for direction from the photographer on timeline questions if there are specific requests for photos during the day. 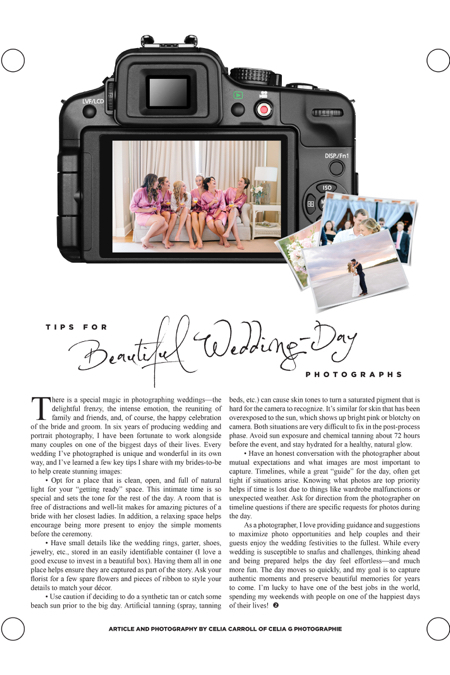 As a photographer, I love providing guidance and suggestions to maximize photo opportunities and help couples and their guests enjoy the wedding festivities to the fullest. While every wedding is susceptible to snafus and challenges, thinking ahead and being prepared helps the day feel effortless—and much more fun. The day moves so quickly, and my goal is to capture authentic moments and preserve beautiful memories for years to come. I’m lucky to have one of the best jobs in the world, spending my weekends with people on one of the happiest days of their lives!